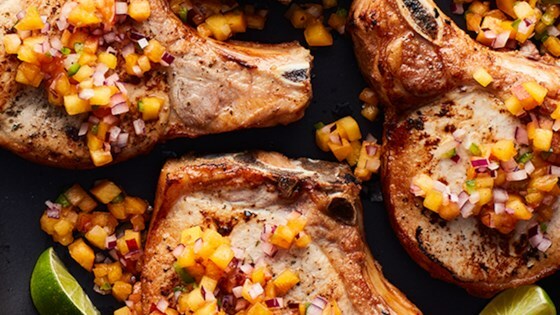 "Simple grilled pork chops are topped with a super refreshing peach-jalapeno salsa in this quick and flavorful recipe." Prepare a gas or charcoal grill over medium heat, with one area set to high. In a small bowl, mix the peaches, red onion, and jalapeno together. Add in juice of a 1/2 lime or more, according to taste. Season with salt and pepper. Set aside. Season the pork chops with Hidden Valley(R) Original Ranch(R) Salad Dressing and Seasoning Mix and black pepper. Sear chops on the hot part of the grill for about 2 to 3 minutes per side. Move to the cooler part of the grill and continue to cook until a thermometer reads 145 degrees F, about another 6 to 8 minutes. Top with salsa and serve. Sweet and juicy, brown sugar pork chops.